View of Lake Michigan at the Indiana Dunes National Lakeshore, west of Portage, Ind. PORTAGE, Ind. (WLS) -- U.S. Steel reported Tuesday morning that their Portage, Ind., facility discharged wastewater containing chemicals into a canal located within 100 yards of Lake Michigan, according to the EPA. The wastewater contained hexavalent chromium, a toxic byproduct of industrial processes. Save the Dunes, an environmental group in northwest Indiana, said the chemical is the "same carcinogenic chemical that appeared in the 2000 biographical film, 'Erin Brockovich.'" 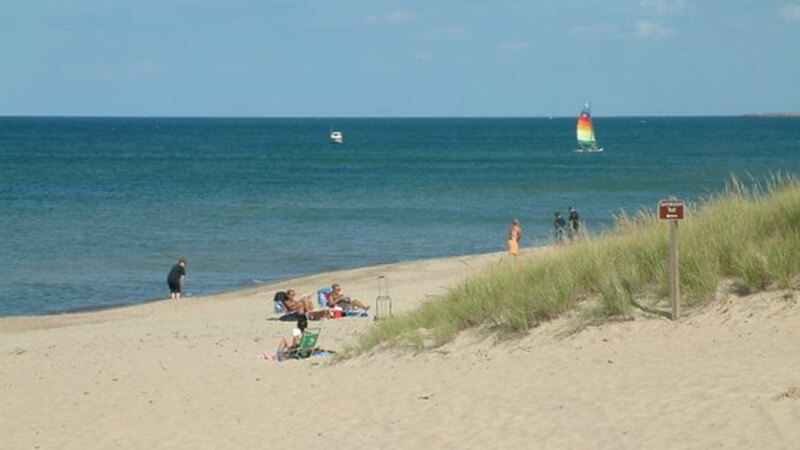 As a result, the National Park Service also temporarily closed two beaches at Indiana Dunes National Lakeshore. The U.S. Environmental Protection Agency was monitoring the Burns Waterway, which leads into Lake Michigan, and determined Tuesday night that "sampling does not show that the hexavalent chromium has reached Lake Michigan. EPA will continue to monitor and will provide updates as needed." It was immediately unclear how much chemical had spilled into the canal, the EPA said. The nearest municipal water source, the Indiana American Water in Ogden Dunes, has shut down its water intake and will use reserve water. The EPA said the action was done "in an abundance of caution."